Born and raised in the Badlands of South Dakota, Brett & Tammy Prang have developed a deep understanding of their surroundings. It is these surroundings that continually inspire them to create their artwork. Their work is a mix of western, abstract and contemporary themes consisting of arrows and feathers to life size buffalo heads, abstract sculptures and furniture pieces. Their artwork is as diverse and ever changing as the Badlands that surround them. A love of art and years of working with metal and leather cumulated into a newfound career in the arts when Tammy asked Brett to create an arrow curtain rod for their home. This unleashed years of inspiration and Incredible Metal was born. Through the support of friends and family and many admirers of their work, Incredible Metal has become a successful and growing business. 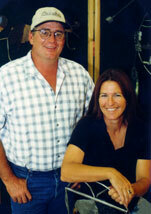 Brett & Tammy Prang continue to run the family ranch and enjoy the balance that creating art gives to their lives.